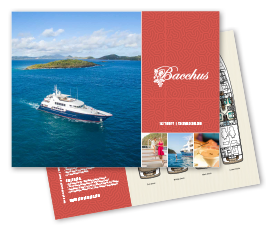 Celebrate, relax, and enjoy life’s simple pleasures with a luxury charter aboard the motor yacht Bacchus. With classic styling and naval architecture by Trinity’s in-house team, the semi-displacement Bacchus is built on a proven hull platform that provides superior safety and performance. At-anchor, zero-speed stabilizers minimize roll and ensure comfort, while underway stabilizers promise a pleasant cruising experience as you enjoy the waters of the eastern seaboard, the Bahamas, or Caribbean. The Roman god of wine and revelry, Bacchus carries the symbol of twirling vines and grape leaves. Designer Ari Loar created a plush, tactile interior décor that invites indulgence and echoes the spirit of celebration. BBQ beach gear with canopy, chairs, table, etc. Facing forward, full beam, walk-around king size bed with gorgeous African Cherry woodwork throughout, ample drawer space, a desk, and a sofa. The 42” Fujitsu Plasma Vision TV is hidden behind artwork when not in use. There are two separate entrances to the walkthrough en-suite his-and-hers bathroom. His, to port, with generous shower and private head locker, hers, to starboard, with Jacuzzi tub, dresser, and private head and bidet locker. Each side has a walk-in closet. Situated mid-ships. Walk-around king-size bed, desk with chair, drawers, and hanging closet. En-suite features Jacuzzi tub with shower overhead, twin sinks, and head. The entertainment system features a 32” TV, with Kaleidescape and iPad docking station. Situated midships: Walk-around king-size bed, desk with chair, drawers, and hanging closet. En-suite features Jacuzzi tub with shower overhead, twin sinks, and head. The entertainment system features a 32” TV, with Kaleidescape and iPad docking station. Walk-around queen size bed, desk with chair, drawers, and hanging closet. En-suite features a large stall shower with corner seat, sink, and head. Entertainment system features 22” TV, with Kaleidescape and iPad docking station. Twin beds each with one Pullman berth can accommodate up to 4 children. En-suite features a large stall shower with corner seat, sink, and head. Entertainment system features 22” TV, with Kaleidescape and iPad docking station. All staterooms include individual satellite receivers, individual climate control, robes, slippers, BaByliss Pro TTTourmaline Titanium 1900W hairdryers, a full length mirror, reading lights, iPad docking stations, and luxurious Bulgari bath products. The MAIN SALON is spacious, elegant and perfectly complimented by the cherry millwork. It features a sofa and four chairs, a game table, PramBerger Legacy Series Piano, privacy blinds, and a fully equipped entertainment center with 60” HDTV with individual satellite receiver, surround sound, Kaleidescape and iPod docking station. Forward of the Main Salon is the FORMAL DINING for 10 guests in comfort. The SKYLOUNGE on the bridge deck is the perfect entertainment and relaxation area with a full service bar, 24” TV, four bar stools, back-lit onyx counters, wine storage for 150 bottles, game table, L-shaped sofa with club chairs and an exquisite world map mural on the ceiling. Day head forward on the starboard side. BRIDGE DECK AFT is accessed by sliding doors from the Skylounge and features protected and shaded seating for up to 15 guests at three tables with exquisite inlaid designs. 50” Plasma TV with individual satellite receiver. The expansive SUN DECK includes an 8-person Jacuzzi forward with wrap-around padded bench seats, a day head, and open deck area with teak chaise lounge chairs, plus optional shades. Full wet bar with fridge and icemaker ensure optimal service, five bar stools plus a 46” Sunbrite TV with individual satellite receiver and a barbecue area.